Liberals, especially young liberals are a ridiculous lot. Whiny, Full of complaints, arrogant but above all liberals are hypocrites. Taken as a whole not a pretty picture. Sadly, liberals are the last people on this planet who can laugh at themselves. Melania Trump’s decision to wear a Zara jacket emblazoned with the words, “I Really Don’t Care, Do U?” as she boarded her plane to Texas captured the attention of the nation. In a segment on his show on Tuesday, Colbert interviewed “FLOTUS” as portrayed by Laura Benanti, during which “Melania” denied that her jacket intentionally sent a “callous message,” while wearing a t-shirt that read “Believe My Clothing” and a “F the Kids” baseball cap. That was just one of the many attacks that our FLOTUS received from the liberal mainstream media! 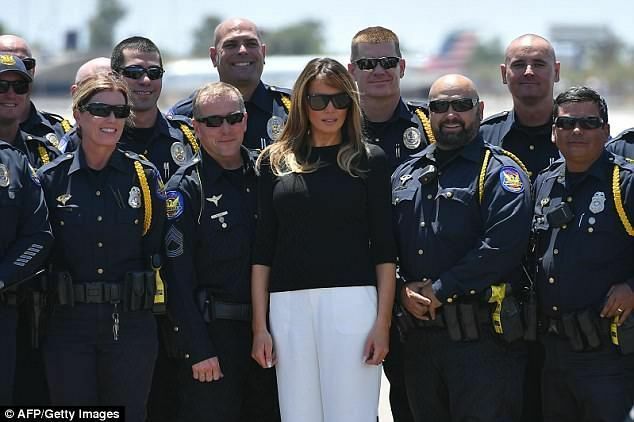 Today Melania Trump landed in Tucson, Arizona, arriving at the US Customs and Border Protection Facility, which serves as an undocumented immigrant intake and detention facility. It marks her second trip to the US border in as many weeks. During her visit to Tucson on Thursday, the first lady visited a Customs and Border Patrol facility, for a roundtable discussion with the Border Patrol, Immigration and Customs Enforcement, the US Marshals Service and a local rancher. She was also expected to tour the Tucson Coordinating Center, a short-term holding facility, and an intelligence center. Thursday’s trip, however, seemed to be fairly scandal-free. Melania will try to fix the problems on the border as much as she can. “She’ll continue to give her husband her opinion on what her thoughts are on family reunification,” Grisham told reporters. 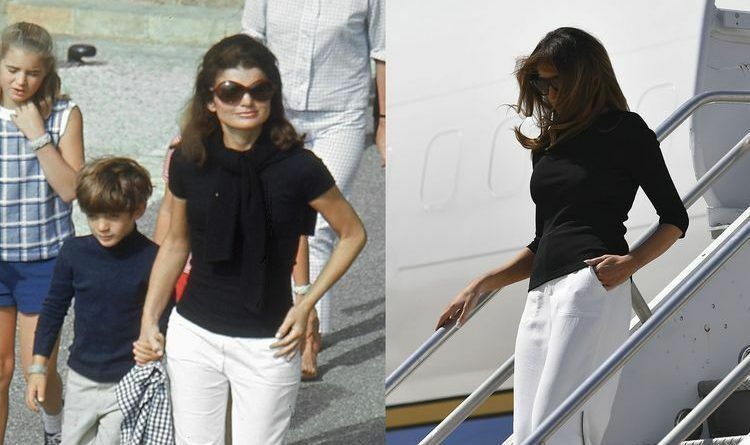 Melania stepped off the plane at Davis Monthan Air Force Base in Tucson, Arizona this afternoon wearing a casual black t-shirt and wide-legged white pants. She accessorized the look with bright white sneakers and oversized shades. Her ensemble appeared to be inspired by what Jackie wore in Greece on the day before her wedding Aristotle Onassis. While some of the details are different—Jackie’s sleeves were short, and her feet, bare—the aesthetic is strikingly similar. I am sure that the liberals will go crazy because of Melania’s outfit and find a way to attack her again!